The Benedictine tradition and the Rule of Benedict that shapes it, has had this role for 1500 years: prayer and work to light a flame so that the world does not run aground and destroy itself. The great monastic Benedict of Nursia (he had a twin sister Scholastica, also sainted. Benedict turned his back on what society had to offer. Like the Desert Fathers and Mothers from whom he learned much, he went into the mountains to grow as a Christian in solitude, at last spending three years in a cave outside the town of Subiaco. 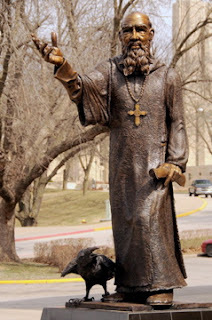 Students came to him seeking wisdom, and a nearby monastery asked if he would serve as abbot. This first experiment did not turn out well; the brothers rejected Benedict. But in the years following, he synthesized half a dozen existing monastic codes as he established a dozen monasteries, learning, listening, and praying about how people from very different walks of life might live, work, and pray together as Christian monastics. The result was one of the formative documents of Western Civilization, the Benedictine Rule. Its virtues are many: Benedict's Rule is simpler and less restrictive than earlier monastic codes, making common sense decisions about how people should dress, sleep, eat, and drink in ways that are appropriate if not extravagant. In doing so, he was enabling a healthy and lifelong Christian journey in community. A medieval saying records that "A lamb can bathe in the Rule without drowning, while an elephant can swim in it." It is at once, accessible and deep. The Rule welcomes Christians of all stations, experiences, and degrees of knowledge to band together, learn together, love each other, and grow together toward God. A central difference between this monastic theology and that of the Desert is that the Benedictine Way sees us progressing toward God primarily in community, rather than primarily through our own efforts. The Rule is, in a real sense, about our salvation together.